Room 209 is putting on a play, and Allie wants the role of Princess but is instead cast as the Evil Queen! Will she realize that not being the lead doesn’t mean she has to give up the spotlight? Meg Cabot is the author of Allie Finkle’s Rules for Girls as well as the New York Times bestselling Princess Diaries series, All-American Girl, Ready or Not, Teen Idol, Avalon High, How to Be Popular, Pants on Fire, Jinx, Airhead, The Mediator series, and the 1-800-Where-R-You series. Meg lives in both Key West, Florida, and New York City. 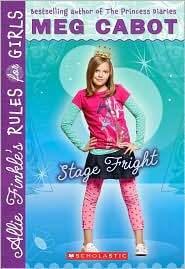 What do you think about the opening line, “What’s amazing is how you can be a normal kid one day, and then something happens that completely changes your life,” of Allie Finkle’s Rules for Girls: Stage Fright? Does it grab your attention? Has your life ever changed overnight because of something that happened? Allie’s mom lands a job on a TV show in town, Good News! Can you imagine if a member of your family became a TV regular? Would you show off or try to hide it? If your class were going to put on a play like Allie’s does, what would you want the play to be? What role would you want to play: actor, lighting designer, set designer, director, producer, choreographer (if there is dancing), costume designer, or make-up artist? Sophie and Allie both want the lead role in Princess Penelope in the Realm of Recycling. Although Allie doesn’t want to step on Sophie’s toes, she also doesn’t want to sell herself short. Would you try out for a lead part even if your best friend wanted it too? What if your best friend got the part you wanted, like Sophie did with Allie’s part? Would you be supportive of your friend or would you need to distance yourself because of your disappointment? Mrs. Hunter’s play is about doing your part to help save the environment. Do you recycle? Do you shut the lights when you leave the room or unplug your appliances when you’re not using them? What other kinds of things do you do to take care of the planet? One of Allie’s rules is “It’s always better to have things out in the open than to let them fester.” Do you tend to keep something inside when it’s bothering you, or do you let it out? Do you think Mrs. Hunter was right in taking away Sophie’s part because Sophie was being ungrateful and lashed out at Allie, or do you think Mrs. Hunter overreacted? What does the line “There are no small parts, only small actors” mean to you? How does it relate to what happened to Allie and her classmates?